When was the last time you colored with crayons? Until recently, when my daughter was old enough to begin coloring, I hadn’t colored in decades. She wanted me to color with her, show her how to do it, and share time with her doing this new favorite activity. Only, I’m not artistic. At. All. I get all closed up and anxious when I’m staring at a blank sheet of paper. I see pictures of friends doing those painting parties and think that’d be a fun girl’s night out, but then I see the blank canvasses they started with and wonder how I’d ever produce something presentable. I finally found a compromise that let me do coloring with my daughter without too much anxiety. In fact, I found it quite fun and relaxing. A coloring book! I found I could color within the lines and let my mind fall into the rhythm of coloring. One of the most ancient forms of prayer is the mandala and it’s used across many different religions. The word mandala means “container of sacred essence” in Sanskrit. It originated as a spiritual practice in the 6th century BC out of the Hindu and Buddhist religions, but is now used by many others, including Christians. Some of the more familiar forms of mandalas are the elaborate powdered marble designs made by Tibetan monks, the sand paintings made by the Navajo Indians, the Celtic knot, and the rose windows featured in many churches. You can use a mandala in your prayers in different ways. One is to find a template with a design (a coloring page) and color it in. Or you might draw your own design and color it in. You may even choose to create your own unique drawing, allowing your hand to create what comes to you in prayer. With a mandala, you start with a circle. Create your prayer space. You don’t have to stay within the lines, but this is your sacred space for prayer. You can draw your own circle on a blank piece of paper or print out a coloring page. Then, begin to color. As you color, let your mind wander. This is not about the end result, but about the process of prayer. Spend time in prayer and talking with God as you color. Or, simply release yourself into His hands and allow God space to speak to your heart. You can repeat scripture or a short prayer as you color, allow your mind to wander through the thoughts God places on your heart, or simply relax into the exercise. As I prayed through a mandala drawing this morning, I realized this one is a difficult prayer technique for me because I crave order and a plan. Starting with a blank sheet of paper and allowing myself to draw without a plan and an end result in mind is a challenge. I want to know that I’m working toward a great outcome. Yet, I was reminded this exercise of prayer – really the whole faith journey – is about releasing myself to the process of following God’s lead. He calls us to surrender, to release ourselves to His control, to focus on our journey not our destination. I needed to let my mind wander and release my thoughts, so God could speak. I needed to accept that my picture may be meaningless and amateur by others’ standards. I needed to release that this prayer is not about the drawing, but about the process of spending time with God. Do you love the adult coloring book craze? Or are you looking for a new option to calm your mind and connect with God in a different way? Take out a piece of paper, make a circle, and draw your way into prayer. Or, choose your favorite coloring book and get lost in the movement of coloring as you let your mind connect to God. PRAY DEEP CHALLENGE: Try coloring or drawing a prayer circle today. Try printing a coloring page and just spend time coloring. Release your mind to God as you color, entering into prayer. Ready to Ignite Your Prayers? Join our 'Prayers and Possibilities' newsletter for weekly encouragement and I'll send you the "Pray Deep Prayer Cards" as a FREE gift. 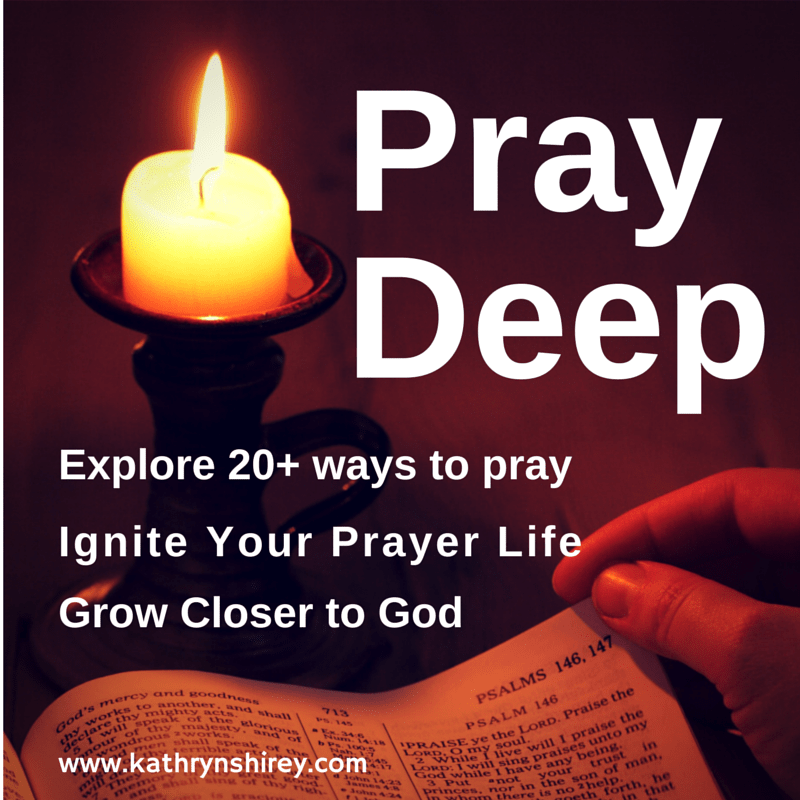 Ignite your prayer life by exploring over 20 different ways to pray. These prayer cards explain how to pray through a variety of methods, sure to inspire and deepen your prayer experience. Already on our list? Enter your info below so I know to send it. Like this post? Explore this and other forms of prayer through the Pray Deep prayer journals. Each book will lead you through a variety of prayer methods through 21 days of focused prayers. Get started with one today! This post is part of the “Pray Deep” series. For more information on the series or to download a complete set of printable prayer cards, click HERE. Sign up today for weekly prayers and spiritual encouragement! « Is God Really Listening To My Prayers? I have never used the mandala process for prayer, personally, though I do journal and create as I write and pray. I would love to take a trip to visit sacred labyrinth gardens some day, just to sit and walk in the beauty and peace that seeking Christ in the ordered pattern brings. I ran across a lot of controversy about using mandalas in Christianity, so was really cool to learn that rose windows and labyrinths are actually mandalas. I actually love how these are used in so many cultures and religions and can be meaningful in different ways. I’m writing about labyrinths next week – highly encourage you to walk one if you’re near one. I bought a blank journal and have a set of nice colored pencils. I scribble on a page and then write names or events or needs in some of the spaces. As you describe, I quietly pray and calmly seek God in the midst of coloring like a child. It is wonderful. I have “Praying in Color” where much of my ideas came from. I look forward to heading over to your links. This really is a fun – and impactful – way to pray. I’m much better at using coloring pages, but a friend of mine does art in hers. She has this amazing one of a tree that just came together as she let her prayer lead her pencil. Turned one way it’s a tree with branches; turned the other it’s the roots. the best part, she said, was her time after when she journaled about the experience and how that picture spoke to her. Recently, while watching House of Cards, there were several brief scenes of men from India (I think, I can’t remember for sure) creating a design on a table. Each person were carefully filling each section with colored chalk (I think). They were focused, no words exchanged, when they finished it it appeared some sort of verbal prayer was offered, the ring of bells, and then they swept the image off the table. Could this been a Mandala Prayer? The design was beautiful and I didn’t understand the meaning until possibly now. Thanks for the enlightenment! It’s nice meeting you through Friendship Friday! I bet that was a mandala prayer! They are used quite a bit in Hindu and Buddhism and I’ve heard that they’ll often sweep them away once the prayer is over. There’s something very relaxing and meditative about a repetitive, non-thinking task – like coloring. The action keeps your mind focused yet available – and I’ve found it can be a great and interesting way to pray. Thanks for sharing that story. I had not heard of the use of mandalas for prayer. I would like to try it sometime. When I saw your title, I thought your post might reference Mark Batterson’s book “Circlemaker”. He talks about prayer as circling around what you are asking for and sometimes physically completing the circle. That is a very rough overview but I found it to be one of the most powerful books I have read on prayer. Thank you for joining The Weekend Brew. Ready to Ignite Your Faith? Join 10,000+ others for our 'Prayer + Possibilities' newsletter with weekly prayer and spiritual encouragement. Ignite your prayer life with these 20+ ways to pray. Free printable prayer cards as my gift to you when you join our 'Prayers + Possibilities' newsletter for weekly prayer and spiritual encouragement. Before You Go - Don't Miss these Prayer Cards! Join the 'Prayer and Possibilities' weekly newsletter to deepen your prayer life and find renewed hope through God. As a thank you, I'll send you these FREE Pray Deep Prayer Cards. 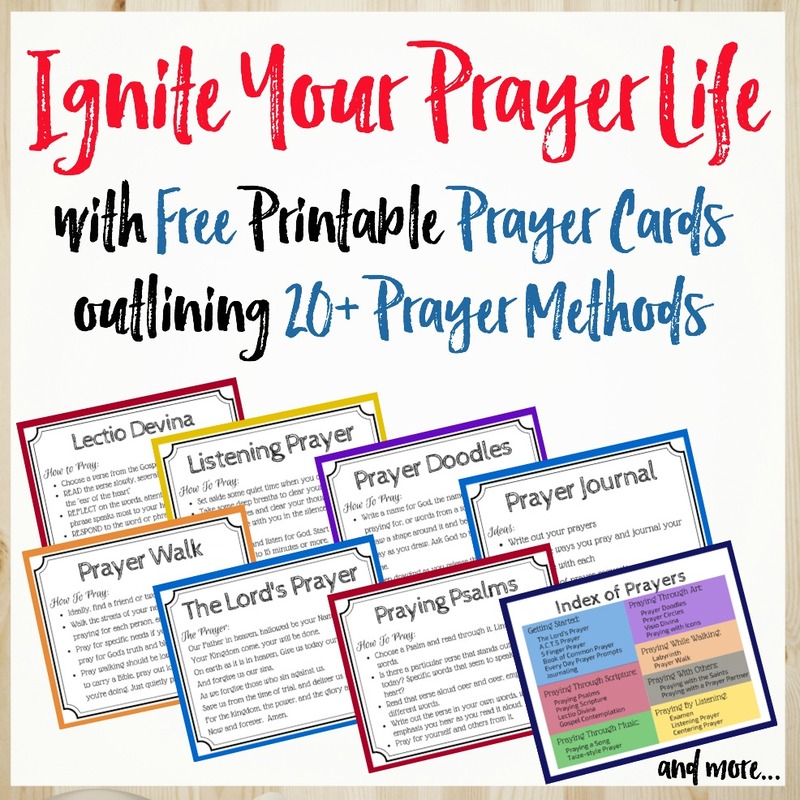 Ignite your prayer life by exploring over 20 different ways to pray. Want to find more peace in the storms of your life? Join the FREE 4-week Trusting God study! START TODAY!